One of the most important PS3 Specifications, to most people, is whether or not their PS3 will play PS2 games or not. That said, there are lots of other specs that can be very important when you are purchasing a new PS3 or trying to get the most out of the one you own. Development and research models included, the Playstation 3 has gone through numerous revisions and variations since its launch in 2006. All in all, roughly a dozen different models have been made commercially available. In this section, we cover the basic features and differences between those models and how they affect use, performance, and maintenance. From systems that are backwards compatible, like the 60gb Playstation 3, to systems that use much less power, like the 120gb PS3 Slim, these PS3 specifications guides can show you the capabilities of the model you own, or are thinking of purchasing. We have also included the PS3 Spec Sheet, which covers most major features and specs that are common to all Playstation 3's. Every model of the Playstation 3 has a model number printed alongside the serial number on the back. These numbers come in two formats, depending on whether you have an original "fat" console or one of the post-2009 "slim" versions. Original "fat" consoles all have model numbers beginning in "CECH," with the individual model represented by a letter afterwards. A two-digit number after the model letter represents the region code of the system. For example, a North America (NTSC) 60gb Playstation 3 would be a CECHA01. These series are generally known as the "original" or "fat" models. 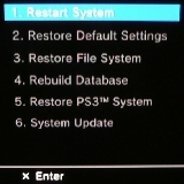 The newer "slim" PS3s have model numbers starting with "CECH-20", followed by the region code and then a letter for that model. Following that example, a North American 250gb console would be a CECH-2001B. Like its sibling the PSP, this model is occasionally referred to as a "PS3 2000" due to the appearance of its model number and region code. Generally it is referred to as the "slim" model. PS3 Spec Sheet - Covers features and specs common to all models. CECHAxx - Model A - Backwards-compatible "60gb" launch console in Japan, North America, Singapore/Malasia and Taiwan. CECHBxx - Model B - Backwards-compatible "20gb" launch console in Japan, North America and Taiwan. CECHCxx - Model C - Partial-backwards-compatible "60gb" launch console in Australia / New Zealand, U.K. / Ireland, Europe / Middle East / Africa and Russia / India. CECHExx - Model E - Partial-backwards-compatible "80gb" console in North America, South Korea, Singapore/Malasia, Mexico and Hong Kong. CECHGxx - Model G - "40gb" console in all regions except Japan. CECHHxx - Model H - "40gb" console in all regions. CECHJxx - Model J - "40gb" console in Japan, Australia / New Zealand, U.K. / Ireland and Europe / Middle East / Africa. CECHKxx - Model K - "80gb" console in all regions except Japan. CECHLxx - Model L - "80gb" console in all regions. CECHMxx - Model M - "80gb" console in U.K. / Ireland. CECHPxx - Model P - "160gb" console in North American, Japan and Australia. CECHQxx - Model Q - "160gb" console in Japan. CECH-20xxA - "Slim" Model A - "120gb" console in all regions. CECH-20xxB - "Slim" Model B - "250gb" console in all regions. CECH-21xxA - "Slim" Model A - "120gb" console in all regions. CECH-21xxB - "Slim" Model B - "250gb" console in all regions. CECH-25xxA - "Slim" Model A - "160gb" console in Japan. CECH-25xxB - "Slim" Model B - "320gb" console in Japan.